With a specifically designed, steel worm that will effortlessly remove all kinds of corks in a few turns and a round, serrated foil cutter that will quickly and precisely cut any foil, this unique product is a bartenders, waiter's or sommelier's absolute best friend! When you are selling in such a demanding market, there is a handful of things that can make your clients coming back for more; quality materials is one of them. Our stainless steel and rosewood multi-purpose gadget, that won't rust after a few uses, is the proof that we don't compromise our quality over quantity! Elegant & Classy Gift Packaging! Our 3-1 waiter corkscrew makes an exceptional gift for wedding, anniversaries or any special occasion. It's the best gift idea you can think of! VinOrama personally guarantees their Waiters Corkscrew will last a lifetime! But if you aren't 100% happy with your purchase, we are offering you a lifetime guarantee - although we're fairly certain that you won't have to use it! Enjoy better wine opening experience for the rest of your life. Click ''add to cart'' now and Order yours new. AN ESSENTIAL TOOL FOR EVERYBODY! - Our 3-1 corkscrew and bottle opening gadget is the ideal solution that can be used by both professionals and home users, as it is practical, durable and extremely easy to use! SLEEK & MODERN DESIGN! - With a comfort rosewood inlay grip handle and a sturdy, heavyduty, stainless steel body, this corkscrew bottle opener and foil cutter is much more than a necessary accessory; it's an elegant, state-of-the-art possession! SUPERIOR QUALITY & CONSTRUCTION! 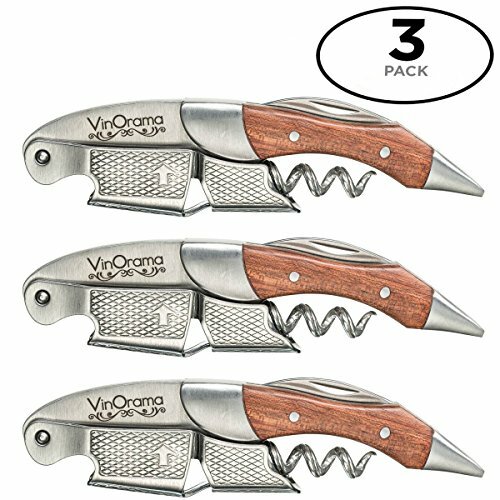 - We, at VinOrama, make a point of using nothing but premium stainless steel and up-to-date production processes for our all-in-one corkscrew openers, to make sure that they can last you a lifetime! NEVER BREAK A CORK AGAIN! - Thanks to our precision-cut notch along the worm that grips the cork securely and reduces the drag as it effortlessly cuts through the cork! 100% RISK-FREE PURCHASE! - Our multi-functional accessory is the best product your money can buy - and we are so certain it is, that we are offering you an astounding lifetime money back guarantee for it! If you have any questions about this product by VinOrama, contact us by completing and submitting the form below. If you are looking for a specif part number, please include it with your message.